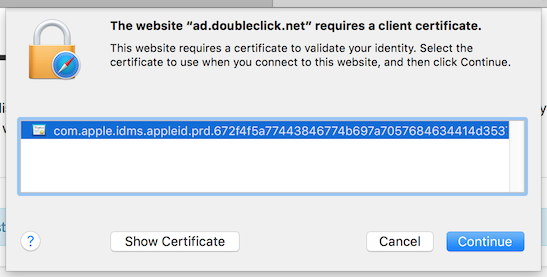 I've noticed today that ad.doubleclick.net started asking for client certificates when browsing in Safari and Chrome on OS X. 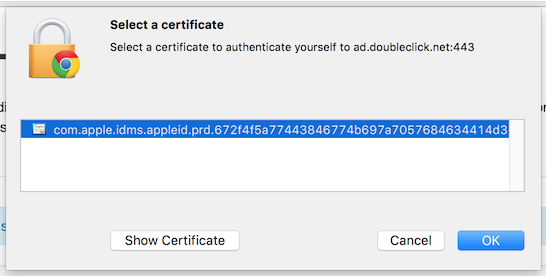 For some reason mutual authentication is being performed by the doubleclick (Google) servers. I'm guessing this is a configuration issue on the Google side as there is generally no need to have the client prove their identity, especially when serving ads. That or this is some new ad tracking technology gone wrong. Either way the problem is for Google to fix and until then there is not much that can be done but to keep ignoring these messages. I couldn't get this to happen in Windows, but both Chrome and Safari in OS X showed the same behaviour. Google must be screwing with Mac users on purpose!